I recently returned to my City concept for a commission headed to the west coast. This is the third version of this graphic approach to city-meets-nature. Based on the SF skyline, a playful ‘line drawing’ of buildings meets water and sky/urban forest. A shimmery natural world is created using line and form borrowed from the built world. Art pieces from my series City were selected for waiting areas in an urban hospital. 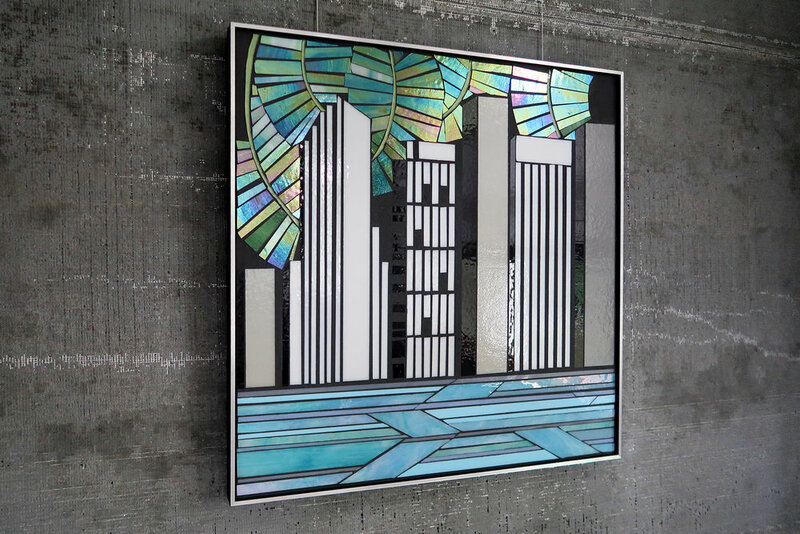 Mixed media work with glass offers viewers a bold and unexpected visual experience. 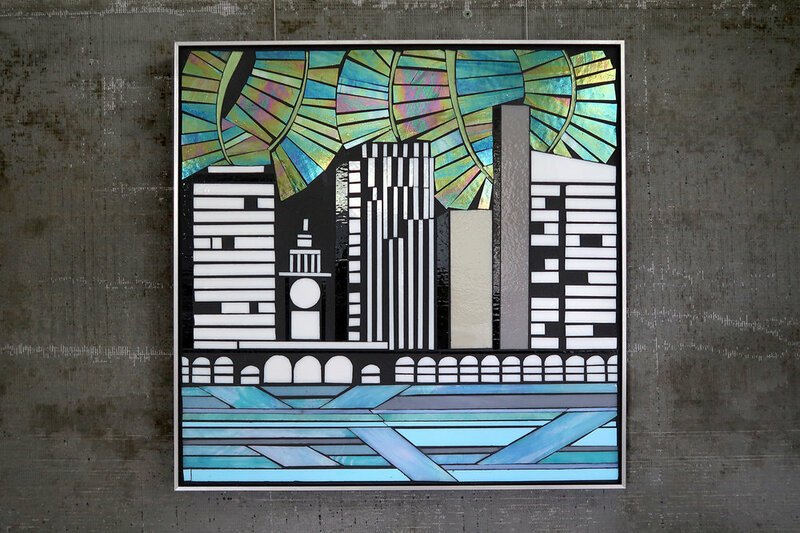 Shimmering cut glass set against matte cement creates a high contrast and dynamic piece that captures the vibrancy and energy of the city. City is inspired by the intersection of natural and built worlds. A consistent graphic approach is used for architecture, urban forest, sky and water. 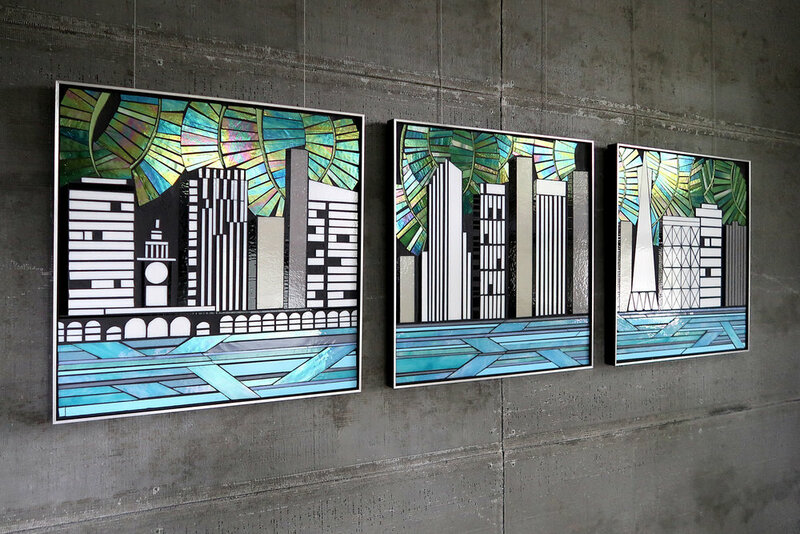 Viewers are offered a familiar skyline with city meeting nature. Collaboration with J.D. Thompson and Associates all occurred remotely. Art consultant Jane Thompson is familiar with my portfolio from previous collaboration. Jane requested the City concept inspired by the SF skyline. A palette of bold grayscale architectural forms meet shimmering blue greens of urban forest/sky and blues of water to create a dynamic visual experience. Iridized glass is particularly effective in catching ambient light and adds additional color tones and vibrancy to the work. Work shipped framed and ready to hang with 3 week turn-around.